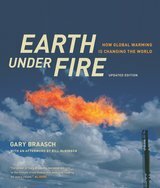 More than a warning, Earth under Fire is the most complete illustrated guide to the effects of climate change now available. It offers an upbeat and intelligent account of how we can lessen the effects of our near-total dependence on fossil fuels using technologies and energy sources already available. A thorough revision and a new preface for the paperback edition bring the compelling facts about climate change up to date. Gary Braasch is an Ansel Adams Award-winning photojournalist and a fellow of the International League of Conservation Photographers. He is the author of Photographing the Patterns of Nature. “Earth under Fire is an important work documenting climate change. With an accessible text and startling photographs, it takes the reader on a world tour of the human effect on our climate.”—Robert F. Kennedy, Jr.